I live in one of the top ten largest cities in the country, yet I only have to travel a few short miles and it feels like I am in the middle of nowhere. 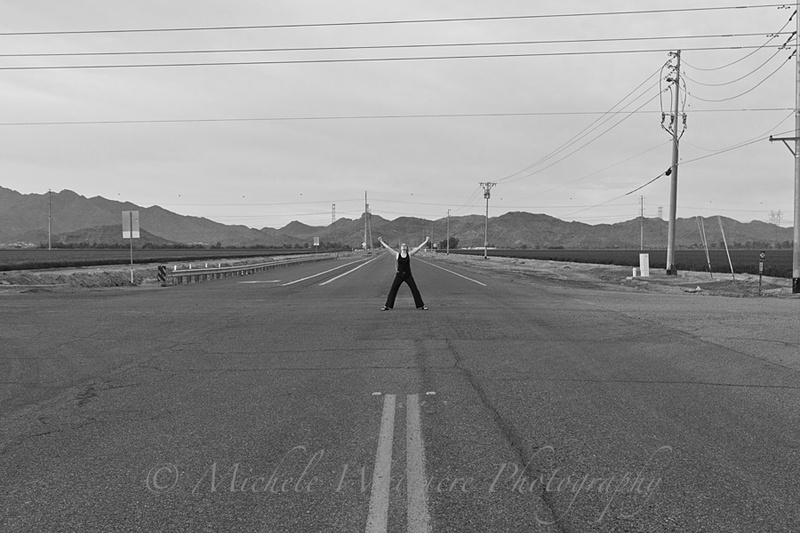 This came in quite handy, as March's self-portrait was taken with me standing in the middle of an intersection. I wanted to find a time where there would be as little traffic as possible to take this photo, so I got up at 5:45 AM on a Sunday morning to do it, which either makes me dedicated or nuts! Remember back in January, when I talked about the rough road I have been on? And how I'd finally realized that the time had come to make some major life changes? Well, it took a while to set the wheels in motion, but the time has finally come for those changes to happen. I couldn't be more ready to embrace the new things that life has in store for me and start traveling down a new path. So, here I am standing at the crossroads of my life, with my arms up in victory for everything I have struggled through and in excitement for where I am headed. I started taking my self-portraits because I felt like it was something that I should do. I thought it would be good for me, and that I could learn a lot from it. You know - one of those tough love kinda things, where I was going to force myself to do something I really didn't want to do for my own good. However, as the months go by I find myself enjoying taking them more and more. If you are a photographer, I would encourage you to consider doing a self-portrait project for yourself! I think you might be surprised at how much you can learn and grow from it. I love this Michele! It was definitely worth all the effort it took to get this photo. I'm excited to see where you're headed! Gyah! I have to get up at 5 AM for school, I can't imagine doing it willingly on a day when I could sleep in! I'm excited to see where you're headed to and will check out January's link. I was recapping your past year in my thoughts a few days ago and what a journey it has been. I don't have to tell you! Just very very happy that you are where you are after all the struggles. May life be good to you this year as you move further forward in your quests. Love the self portrait!